Posties around Australia are about to hit the pavement on a fleet of new e-bikes and special three-wheeled electric delivery vehicles. 4,000 new e-bikes will be rolled out around the country by Australia Post to bring their e-bike fleet to 5,980 over the next three years. The have also ordered 1,000 of the new electric delivery vehicles (eDVs) which have been developed to suit the needs of the modern postie. The eDVs have capacity for large parcels and deliveries from online retailers that could be difficult for traditional postie bikes or motorcycles to carry. Australia Post Group Chief Operating Officer, Bob Black, said that they will be safer and more efficient than motorcycles. “The eDVs are safer than the traditional motorcycle. They are easier to see on the road, more stable, have increased rider protection and lower on-road speeds, all of which reduce a postie’s exposure to incidents and serious accidents." Could posties pave the way for footpath riding? The eDVs have a top speed of 45km/h and like traditional postie bicycles, e-bikes and motorbikes, can be used on footpaths. Legislation in Victoria and New South Wales says that posties are exempt from rules that don't usually allow footpath riding and now they will also be allowed to use the larger, faster vehicles on the pavement. It makes sense that posties can use footpaths, and it is also demonstrates that there is no reason why anyone else should be banned from riding a bike on a footpath. If it is ok to drive a vehicle on the footpath when it is the width of a footpath and goes 45km/h, then there should also be no problem with people riding bicycles on the footpath. Posties have for long time been linked to bike riding and its benefits. In 1953 Scottish researcher Jerry Morris discovered that postal workers who were out delivering letters on bicycles suffered less heart attacks than their colleagues who sat in the post office sorting mail. It was one of the first studies to show that physical activity reduces risks of cardiovascular disease. Perhaps in 2019 we could realise that our posties are onto another good thing and let people of all ages ride on the footpath. Bicycle Network regularly discusses changes to footpath riding laws with politicians and decision makers, but we would love it members and riders could help the cause. Visit our footpath riding campaign page and contact your local MP today. 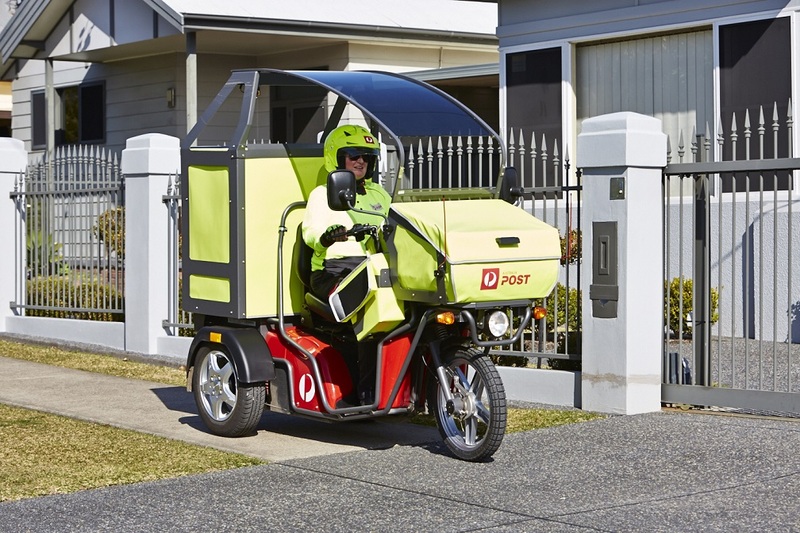 An example of a new Australia Post electric delivery vehicle. Click here to read more about the vehicles.